…In case anyone was wondering, I’m still alive. Very much alive. Just totally consumed by teaching 3rd grade, and spending about 12 hours every day in my classroom. And when I stop teaching, planning, thinking about teaching and planning, assessing student work, thinking and re-thinking about every interaction with my students, and realizing that none of it is ever going to “be enough”, I can barely move, let alone think about updating my blog. But I have been finding rare moments to bake (because how could I not??). However, I haven’t been taking as many pictures of my creations as I am used to, so I have less to show for my time than usual. And to boot, as a re-emergence post, this blog entry is a repeat recipe. But a delicious repeat! 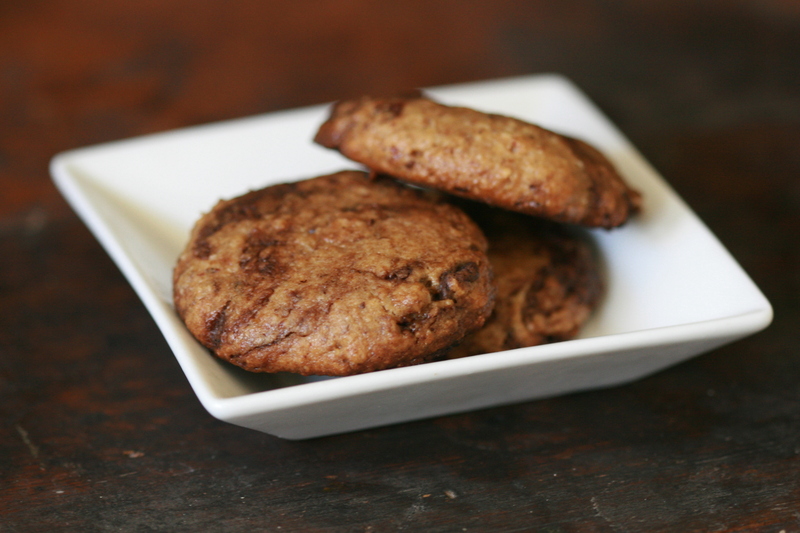 Remember my Carob Date-Nut Cookies? Well, I recreated them for Talia’s birthday back in September and this time I ground the nuts to a fine powder before mixing them with the other ingredients – this created a much smoother effect and the cookies ended up looking and tasting a little bit different. I’m not sure I recommend one way over the other, they were just different sensations. I’d recommend you go make these cookies right away though, because no matter how you grind the nuts, these cookies are still my favorite snack and hit the spot! For a gluten-free, sugar-free, vegan decadent birthday celebration, we sandwiched these cookies around homemade Lavender Coconut Agave Ice Cream. Couldn’t have been better; except that I made a second batch of cookies! I whipped up some Honey Lavender Hazelnut Cookies to mix-and-match ice cream sandwich flavors with. Stay tuned for that new recipe, coming soon! Ps. Becky, this post is for you. Thanks for being my #1 fan, and motivating me to update! A few months ago when I was in New York, I made a variation of these cookies with my friend Marika. We ate so much batter, we couldn’t stand the idea of baking the rest into cookies that night. She met me for yoga the next day, and brought the cookies (freshly baked that morning!) for an after-yoga snack. 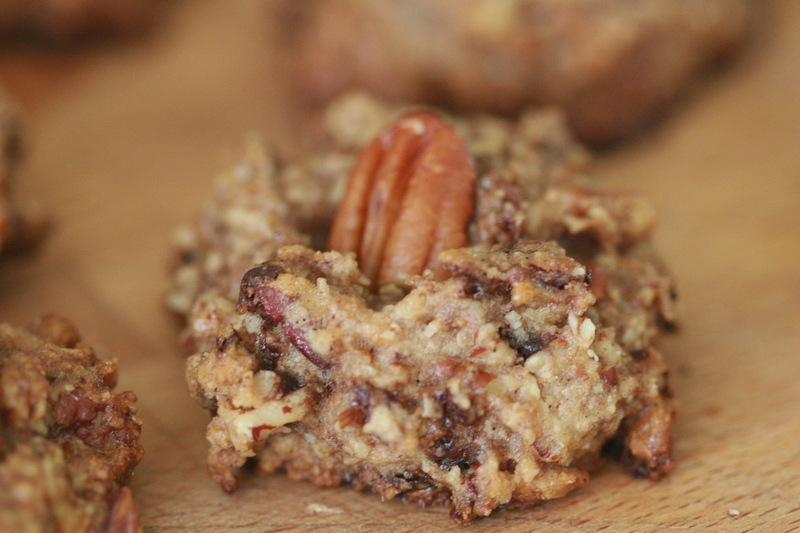 These are the perfect energizing treat, and without wheat, gluten, refined sugar, and packed chock-full of nuts and dried fruit, they feel healthy. In fact, they are healthy. But, they don’t taste healthy! So, when Marika visited me in California last month, she brought the recipe with her. I hadn’t had a chance to make them until a few days ago, when Talia and I wanted to whip up some goodies. They are so easy and fast to make – and don’t require specific fancy ingredients! You can use whatever kinds of nuts you have in your house, or leave out the carob chips, or substitute another liquid sweetener (honey instead of brown rice syrup? ), or adapt them to whatever your preferences are. Make sure to eat a lot of the batter before baking them, just because. Bake the oats and pecans on a baking pan for 10 minutes. Food process the rice flour and half of the oats till they are thoroughly combined and finely ground. Add half of the toasted pecans to the food processor and grind to a fine meal. Add the rest of the oats and pecans, as well as the cinnamon and nutmeg, and pulse once or twice (leaving some whole oats and chunks of nut). Mix the wet ingredients together, and add to the dry. Fold in the dates. Pulse in the food processor till fairly smooth. By hand, stir in the carob chips. If the nuts and oats were still warm when you added them to the batter, the carob chips may melt and be incorporated into the batter – if not, they will stay whole and you will get lovely chunks of carob in each bite of delicious cookie! 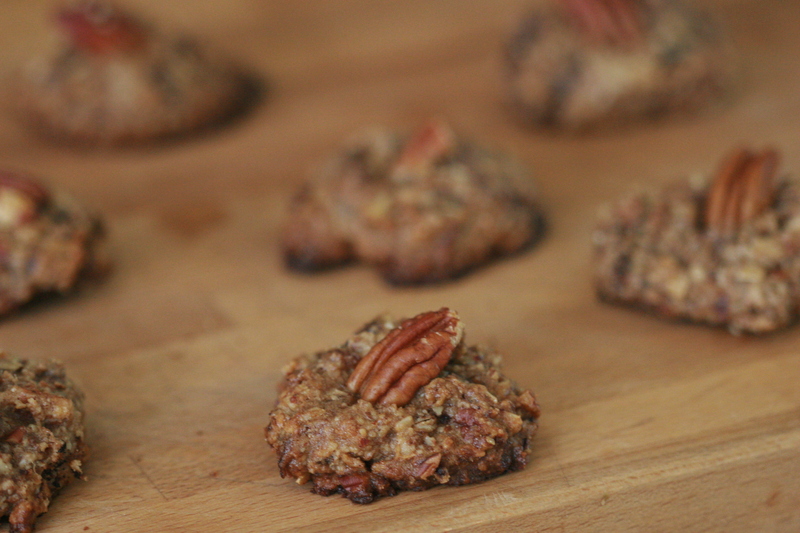 Drop tablespoons of the batter onto lightly greased cookie sheets, and top each cookie with a whole pecan. Bake for 15-18 minutes, until browned around the edges. Here are gluten-free, sugar-free, chocolate-free, dairy-free chocolate chip cookies, made for a friend who can’t consume gluten, sugar, or chocolate, and I am vegan so my recipe of course couldn’t include animal products. How could I let her live without yummy baked treats?! I had to do something. A note about the ingredients I used: I know that Xylitol sounds like a chemical, but is not – it’s produced traditionally from birch trees but more often found now made from corn – it’s easier to digest than regular sugars so many people who are diabetic or have trouble processing sweeteners can eat it. It is what is used Tom’s of Maine toothpaste as a sweetener, and my yoga teacher raves about it. If you’re eating it in cookies, it’s a fine amount to consume. In terms of gluten-free flours, typically I like to use my own mix of rice flour, almond meal, and coconut flour (and i want to start experimenting with tapioca and quinoa flours too), but this time I had a store-bought mix on hand and so I used that for this recipe. You could make a mix of your own if you want; Usually I use mostly rice flour with a bit of almond and coconut flours added to help with texture and flavor. Preheat your oven to 350 degrees. Cream together the Earth Balance and Xylitol till fluffy. Add the molasses and vanilla and mix. Next, add the flours, xantham gum, baking soda, salt, and mix well. Fold in the carob chips. Drop by teaspoonfuls spaced about 2 inches apart onto ungreased cookie sheets. Bake for 8-10 minutes, until slightly browned but still soft to the touch. They fell apart when I initially tried to take them off the pan, but hardened set together after I left them to cool on the baking sheets for 5 minutes. After 5 minutes, transfer to a cooling rack.